CAD/CAM for Jacquard Woven Fabrics. Computer Aided Manufacturing or CAM systems allow you to edit the artwork keeping in perspective the differing Warp and Weft densities. You can edit the design in grid mode for greater accuracy by using a range of drawing, painting and editing tools provided in CAM. Variable brush size with differing X, Y thickness can be used in tandem with the freehand, geometric, beizer and advanced editing tools such as auto outline, bandani, etc, with multiple UNDO & REDO functions. Computer Aided Manufacturing also offers colour shield facility while editing and copy paste functions enabling protection of intricate motifs. 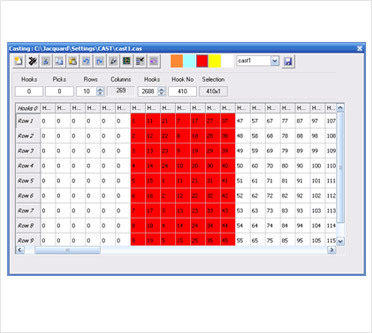 Naturally all editing features are used in the online editing mode on the jacquard design software with various repeat types such as Straight, Cross, Mirror X, Y and X-Y. 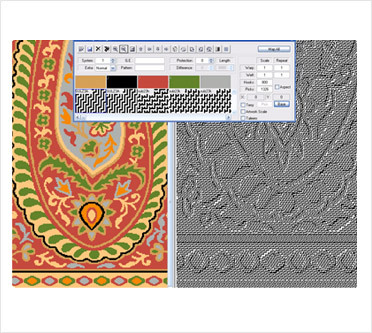 Navigator of the jacquard design software allows easy access to different design areas while editing in Zoom/GRID mode. Facility to insert hooks / picks in artwork stage. Simple and Intuitive User interface enables enhanced functionality to Design Jacquard weaves can be created from scratch, satin, twills built on the fly weaves can be combined, rearranged adding thrust to creativity. Single and multi - layered weave structures can be achieved easily in the computer aided manufacturing. Auto satin and twill generator to create satin weaves with varying repeat and steps is achieved in the computer aided manufacturing systems quickly and efficiently. Weave library provided for better management of weaves and simple drag and drop function in combining weaves at pre-defined intervals to create fascinating weave structures. 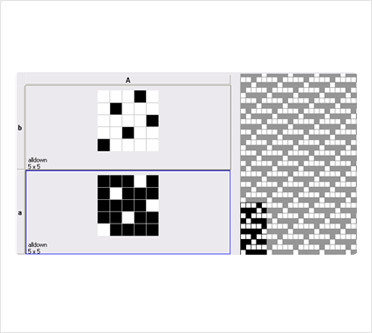 Complex weaves can be easily created by combining basic weaves by way of simple assignment to the warp and weft interlacement points and specifying the number of repeats. Thus, an otherwise cumbersome operation is simply reduced to a couple of clicks with the jacquard design software. Auto generation of weaves by simply importing Bitmaps images adds to the creative abilities of your team, thereby adding to the beauty of the patterns. Facilitates assigning of weaves to different areas of artwork denoted by different colors. 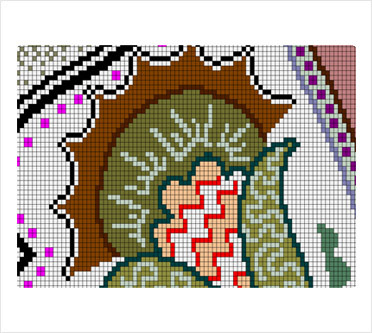 A simple mouse click creates the detailed Weave plan on graph. Front and Back weaves can be viewed simultaneously for better understanding of the final fabric quality. Extra Warp and extra weft weaves can be created to give a special touch to your dextrous creation. Number of hooks required for the design can be varied online and the fabric effect can be viewed. Graph can be viewed in mono, artwork, warp and weft colours for editing and evaluation for the final to be sent to the computer aided manufacturing system. Automatic and manual find float facilities to locate warp / weft floats exceeding specified limits. You can assign unique colours for warp and weft floats for ease of control and editing. The floats can be edited using the brush tool. Presenting your concepts in a realistic way at a click of a button and no extra cost is what this feature aims at be it an internal evaluation or a sales presentation, a good simulation is the acid test of your efforts. You can vary the different parameters of a design or edit the design and observe the result instantaneously. Simulation is further enhanced by using yarns created or scanned directly into the library. The yarn editor allows you to work on parameters such as twist, colors, thickness, etc to generate chenile, fancy, slubs, melanges, twisted, and all types of yarn effects. The simulated output can be further tested on a 3D CAD system. Finally, the created design from the jacquard design software can be seamlessly integrated with the Electronic Jacquard machine, Card Punching machine, etc. Compatible auxiliary modules for Electronic Jacquard like Bonas, Staubli, Grosse, etc. enable transfer of design details in the electronic form. Computer aided manufacturing allows easily configurable cast out facility for defining hooks which have been reassigned from their normal position in your harness ends. Graphical and easy to use interface. User can define a basic casting sequence which can be replicated across the harness or user specified range, with a single click. Casting files can be saved enabling management of different harness arrangements within the same shed. Weft selector, cramming, terry, fringing can be defined in the function file. Variable weft density can also be specified in the electronic function file. 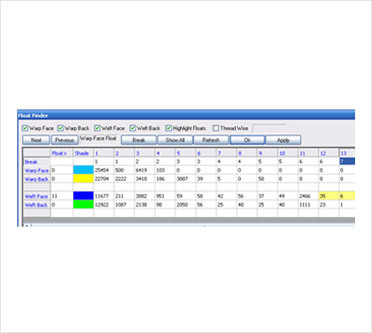 Graphs can be printed for manual card punching, or the design information can be transferred to Electronic Card Punching machine for punching hard card / continuous paper punched cards from the computer aided manufacturing systems. Detailed statistics lists occurrences of differing float lengths in a simple and tabular structure. User has the facility to choose undesirable float length and the system would highlight its occurrence in the Card image file. Further a manual / automatic command is available for eliminating the float length. Simply specifying position to cut the float & Choosing the Break button would automatically clear all the extra length floats from the CI file. It is a software innovation that comprehensively solves the problem of detecting and binding floats in fully automatic mode. Depending on the weaves used, the floats are found and analysed. According to this analysis the floats are bound exactly at their transition points, which avoids creating new floats. The binding points themselves - depending on the weaves - can be set to only occur on certain ends or picks. Even float lengths that are smaller than the ones appearing within a regular weave will be found and edited properly. Regular weaves, therefore, will not be modified. Twain compliant true colour scanning. Ensures a good quality scanning with various controllable parameters such as brightness contrast, Hue balance, etc. This important feature ensures a good starting point for an excellent output. Extensive Controls provided in the system to automatically generate outline on select areas of an image, with user defined colours / thickness for the outline. This is a strong facility to draw an accurate and symmetrical outline select colour parameter. Drawing tools such as pencil, brushes, etc allow you to create images. An extensive array of functional tools such as Clone tool, Pattern fill, Magic wand, magic fill, gradient fill, bezier tool etc and innumerable brush styles are available to either create or edit designs. Colour printing facility allows the user to define various parameters and reproduce the same on the media. Pinking shear effect is the hallmark of this feature. Colours used in the design can be printed along with swatches.